This will be the first part of many in a series of reports that I will offer for free to the community. The reports will cover wide range of items from OS Migration dashboards, Bit locker reports, SCCM Infrastructure health, Client health, Collection evaluation, etc. In each report I intent on there to be plenty of visuals to provide the tech a clean overview of what is happening in the environment. There will also be several troubleshooting notes included in this report to be a 1 stop shop for troubleshooting tool. Some reports during this series will have troubleshooting guides available as well. So far I am intending to release Client Installation Troubleshooting guides for OSD, client install, and software updates as I have already written several of them for previous customers. The first report to be released will have a focus on identifying problems with client installation and providing some good. This will eventually grow into a “Client Health Assessment” where there will be multiple reports all focused on client install/health/active etc. Below we are able to get an overview of the client install failures within the last 30 days, and keep an eye on how many clients we currently have in the environment. 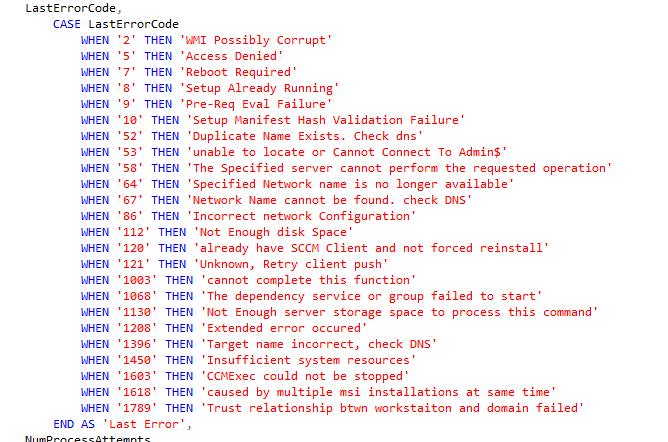 I’m leveraging several CASE WHEN statements to translate the error codes to something the tech can easily troubleshoot. Please not that if your total systems number is off from what you see in your SCCM Console then look into your maintenance tasks/discovery items. 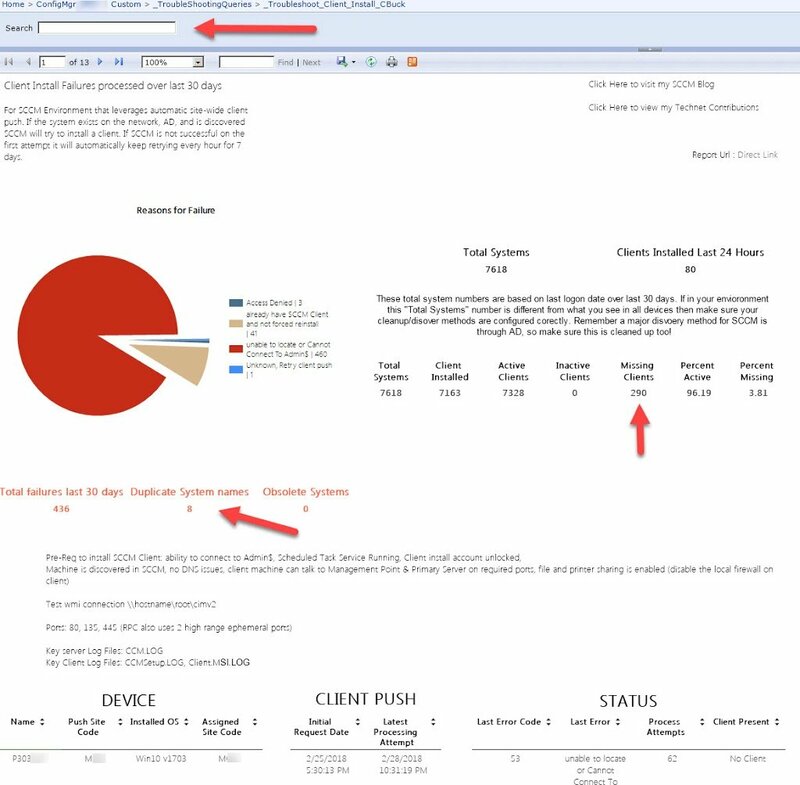 It is not uncommon for me to see customers environments that do not have AD cleaned up…so long story short make sure your AD environment is cleaned up too. Future Revision of this report will be released as part of client health Dashboard, with a few other reports.